Took his vows with Ms. Kate Adams. More famous than they could fathom. All was perfect ’till month nineteen. The result left her deaf and blind. Now more determined she refines. With a girl named Laura Bridgman. For Helen it had all began. The type of doctor that could tell. His name Alexander Graham Bell. Perkins Institute for the Blind. To Helen was more than kind. Knowledge taught they did not curtail. Five languages she learned in Braille. Wright-Humason School for the Deaf. Like cooking with words she was a chef. No deaf blind person had done that before! Seemed to give her a special lift. This was Japan’s official gift. Both are heroines in our Nation. Helen and Anne Sullivan traveled all over the world to over 39 countries, and made several trips to Japan, becoming a favorite of the Japanese people. 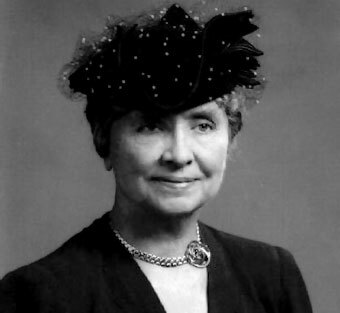 Helen Keller met every U.S. President from Grover Cleveland to Lyndon B. Johnson and was friends with many famous figures including Alexander Graham Bell, Charlie Chapin and Mark Twain. On September 14, 1964, President Lyndon B. Johnson awarded Helen Keller the Presidential Medal of Freedom, one of the United States’ top two highest civilian honors. Keller devoted much of her later life to raise funds for the American Foundation for the Blind.. She died on June 1, 1968 passing away 26 days before her 88th birthday, in her Easton, Connecticut home. In 2003, the state of Alabama honored Keller, a native of the state on its state quarter. The Helen Keller Hospital is also dedicated to her.